Traditional Korean style hotel! Mizo hotel in Myeongdong! 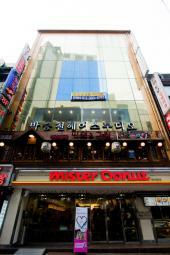 Former Myeongdong Prium Hotel reopened as Mizo Hotel in Myeongdong, the most famous shopping and tour location in Seoul. With economic prices compared to other hotels, it has 26 guestrooms with diverse amenities. There is a esthetics center within the hotel and guests are given a discount. The neat hotel also boasts Korean traditional features in harmony with modern characteristics. The lobby lounge also offers complimentary donut, tea and coffee service. Internet access, humidifier and water purifiers also add delight. Myeongdong station (subway lie 4) is within 2 minutes, a conveninet location to enjoy the diverse restaurants, cafes and entertainment in the area. Come stay at Mizo hotel for rest and comfort! All guestrooms are equipped identically, but vary in size. Ondol A can be reserved for 3 people (2 people or less cannot make reservation). Iron, converter can be rented at front desk. No bathtub, shower booths only.